Ben Franklin was one pretty smart guy. He invented bifocals, edited a newspaper and got himself on the hundred dollar bill. Have you ever seen his journals? He liked to ask all the questions. How else do you wind up flying a kite with the intent of getting struck by lightning! Okay, we still think his whole "flying a kite in the middle of a thunderstorm" idea might not have been the best idea ever since that could have really turned out badly, but he's a genius, so who are we to argue? All of humanity is now in his debt. We wouldn't want to go back to living without electricity. How would we charge our phone? Of course, history is filled with amazing stories and Ben Franklin is part of many of those American history stories. That's why we like this costume so much. It's the perfect opportunity to learn about our rich history! 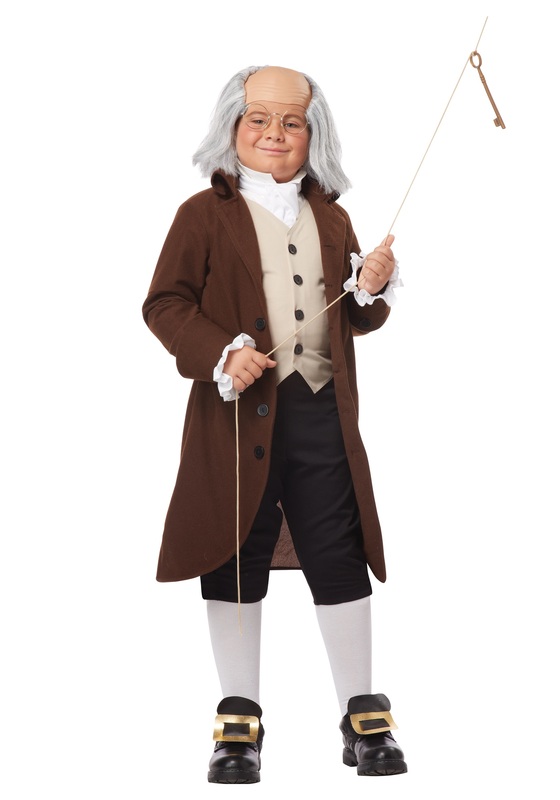 This costume makes your little history buff look just like the legendary figure that we know so well from our books and monuments. We can't guarantee that while wearing it, he'll be inventing the glass armonica like the real Benjamin Franklin, but he will look cooler than the other kids at the next American history pageant that your child is in, and we think that's just as important as the invention of the glass armonica. It's got the felt coat with attached vest and cuffs, all in drab tones that just say the 1700s. No costume from that era would be complete without a cravat, and this has one! The knicker pants go to the knees and fit easily with elastic. Okay, so he's going to learn all about history while wearing this classic costume, but whatever you do don't let him go out in the thunderstorm with that kite. We already have electricity. It's all good. He can just sit back and learn the glass armonica like all the other kids are doing these days (we assume). I have never written a review but the costume was quality, perfect look, and fit as expected. The sizing was spot on and made it easy to put on and take off over clothes. I honestly thought the whole costume physically was going to bring in the Glasses and the wig, my son was so happy to get it once he open it it wasn’t there but otherwise it's a nice costume.